I’m celebrating Liverpool’s 800th birthday from the air with my favourite photograph I took on my recent flight over the city in a Dakota. Jeremy - What that shot doesn't show is the huge building site to the left of the shot where a new one billion pound collection of shops and offices is being built or the new museum down by the docks and other regeneration planned down there. Up toward the top of the picture around where I work is a large building project and others waiting to start. The blue roofed building is a hospital thats a bit over 10 years old. Liverpool has it's areas of history (and some of them are designated as world heritage sites) but all the time I've been here regeneration has been going on and the pace keeps getting faster. There was a time, when I first arrived here, that the police vans were always fitted out for a riot and there were armed police patrolling with their weapons clearly visible. There were areas you were warned not to go to if you weren't local. You just don't see that anymore and I'm a lot happier walking round Liverpool day or night than several other cities I know. While the regeneration hasn't been as dramatic as some other cities it is happening and it keeps going. While events here last week are very sad Liverpool isn't what I would call troubled anymore. Liverpool seems a bit of a troubled place right now. Best wishes. It's a wonderful image! "Will you still need me. Will you still feed me. When I'm 800 and four!" Great shot... wow, 800... I don't feel so old anymore. The flight must have been incredible! Gosh that's over twice as old (nearly 3 times) as my country! that is a great shot from an airplane...not always easy to do. That's really cool! Great shot! Great shot. I was only in Liverpool once (as a Beatles fan it was like a trip to Mecca). Looks cool from the air. What a lovely photo! Happy Birthday, Liverpool!!!! 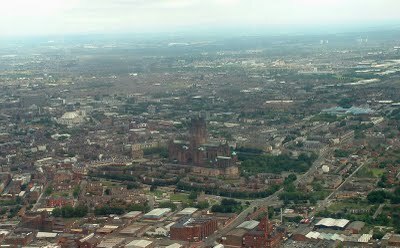 happy 800th bday to Liverpool! great aerial view (and shot!). It's hard to imagine 800 years... what a long history this photo shows. Nice shot, not sure how I'd get on in a plane! What a cool picture. My dad was born there. great aerial shot! thanks for dropping by earlier. Fun and cool shot. 800 years old? Wow. My hat's off to you! This is a fun and interesting aerial shot. Happy birthday to Liverpool, too!